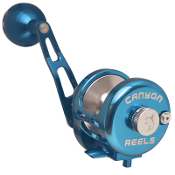 All new for 2016, the HS-13 Cast Control reel is built to be dependable, accurate and durable. The spool control makes for reliable casts without any backlash. The sturdy T6061 aluminum frame and 100% stainless steel gears and bearings mean it can stand up to any fight. Crank in the toughest fish with a 5:1 gear ratio that makes for massive cranking power. This reel is promised to last, with a Lifetime Frame Warranty.